A fair proportion of road users try to locate radars (speed cameras) by surfing the internet in the hope to find websites that show their exact location. Well, you may no longer need to do this if you ride your motorcycle in France as it would appear that some people are keen to disclose their location alongside the road to attract fellow road users into their shops or restaurants. With the current economic downturn, why not find alternative ways to boost your business? 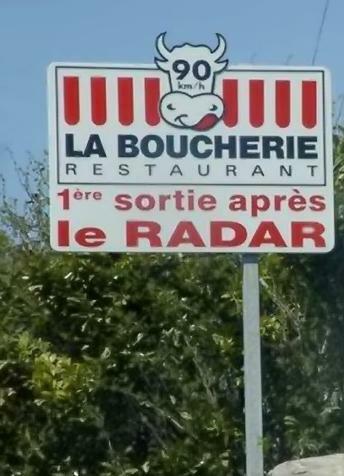 One of our readers has recently come across an advertisement alongside the road that says below the restaurant name “1st junction after the radar” (see photo on the left). Now this is a really smart way of attracting customers into your business, isn’t it? Not only drivers avoid getting caught by the speed camera by being warned of its presence but also they can enjoy a nice French meal on the money they have saved by not being caught overspeeding. Radars have become a real and serious business in France with 630 million euros worth of income for the government in 2011 through 13 million pictures of car drivers and motorcycle riders across the country (up 1 million compared with 2010). The government predicts to make 700 million euros in 2012 with an additional 400 machines installed and 324 million euros already cashed in between 1st January and 30th June. One radar on its own located on the A41 between Annecy and Geneva brings to the government 22 million euros worth of income per annum with 462 pictures of overspeeding road users per day. This is even getting worse with the new “segment radars” where a series of cameras are installed on the same road and across a certain distance to calculate the average speed of a driver or rider rather than simply flash them at a specific location. The new French socialist government is desparate for money and is keen to do whatever they can to fill in the coffers. Catching drivers and riders overspeeding by increasing the number of speed cameras on the roads is one thing but the government is also looking to find ways to increase taxes (and implement new taxes) wherever they possibly can. So those who are keen to boost their business can use advertising in a smart way like this particular restaurant. The French have now got theft into a fine art. There is no reason to visit france. I used to love travelling through france on my car and bike, but know the country is dead to me. Stealing on the rodes has got so bad, it best to avoid if you dont want your holiday ruined by nuisance cops.